In my last post, I shared the stunning fall leaves in the North Carolina mountains. The whole thing is quite impressive, but the leaves only last about one month out of the whole year. If you can’t make it to North Carolina to see the trees, many other amazing adventures await in our mountains. In Haywood County, located between Asheville, NC and Gatlinburg, TN, one of the coolest things you can see is the elk! Back in the 1800s, elk roamed the North Carolina mountains, but as the human population grew, the elk population dwindled — to nothing. 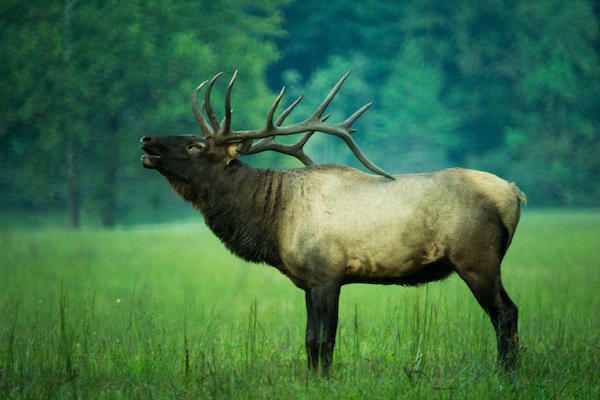 In 2001, efforts were made to restore the elk to the region, with 52 released to the Cataloochee Valley to roam freely. Today, the herd numbers more than 150 — and the elk have been seen in the Great Smoky Mountain National Park, Maggie Valley and Cherokee. How cool! When visiting the region, remember that the elk are wild animals. They roam freely. This is not a zoo! Please don’t feed the elk or get closer than 150 feet from them (that’s half a football field). Take photos — take video — take nothing else. Thanks! If you get to visit during the fall, consider these activities as well — all family friendly. All frugal. All fun! Cold Mountain Corn Maize — Run by Skipper Russell, this fall tradition opens on September 24. This year’s maize pays tribute to the 50 year rivalry between Pisgah and Tuscola! How cool is that? Hours vary, so check their Facebook page for current information. 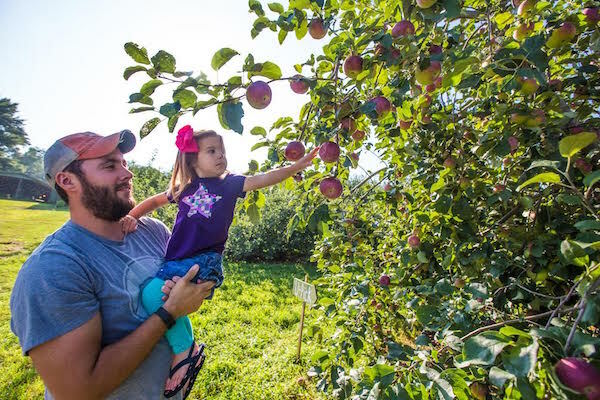 Nearby, explore the area’s agricultural tradition with a visit to Barber’s Apple Orchard, the Apple Harvest Festival and/or the Paynesville Historic Farmer’s Market. Stay at Cataloochee Guest Ranch, which offers hiking, horseback riding, wagon rides, snowboarding and skiing. The ranch offers cozy cabins and lodge accommodations, some accommodating large families. Rates vary — but generally include all activities except horseback riding and include breakfast and dinner. To learn more visit the Haywood County tourism site. Photo credit Haywood County TDA. Used with permission. Between Asheville and Boone, the town of Burnsville (in Yancey County) is everything you might expect in a small North Carolina mountain town. 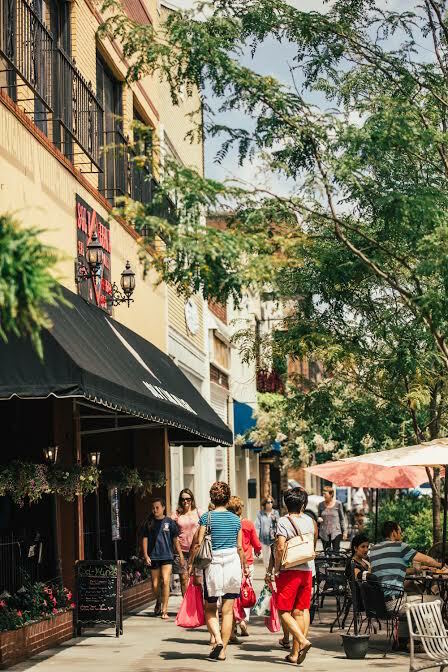 The walkable downtown has shops, galleries, wooden rockers and murals painted on red brick walls. If a movie was filmed here, Burnsville would fit the role of small mountain town perfectly! Photo credit Explore Burnsville. Used with permission. The surrounding area is not half-bad either! Yancey County is home to six of the ten highest mountain peaks east of the Mississippi. 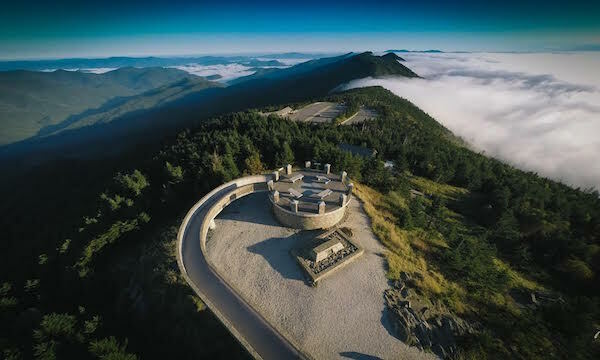 The most famous, Mount Mitchell, stands tallest — and from the observation platform, you can see 85 miles! 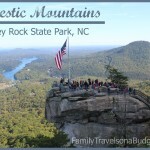 Not surprisingly, you’ll find waterfalls, hiking trails, clean rivers, and winding mountain roads throughout this section of the North Carolina mountains! The Quilt Trails of Western North Carolina offer a fun treasure hunt through the mountains. 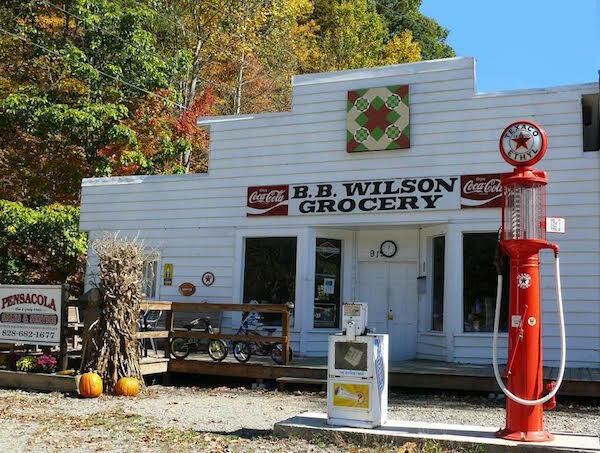 Enjoy the views, especially the fall foliage, as you hunt for colorful quilt squares painted on the sides of barns, buildings and businesses throughout the region! Clear Creek Dude Ranch might be a better choice if you don’t want to camp with the bears. This award winning ranch offers an incredible ranch vacation experience. Riding trails take you through miles of North Carolina mountain wilderness. All inclusive rates include meals, horse back riding, river tubing, line dancing, bonfires and much more (rate varies by season). To learn more about vacation opportunities in Burnsville and Yancey County, visit the tourism website. Mount Mitchell. Photo credit Sam Dean, used with permission. Every town has its specialty and Hendersonville’s is apples! The county, just south of Asheville, produces more apples than any other county in the state. Many orchards open to the public for apple picking. Have you ever eaten an apple fresh off the tree? So crisp. So sweet! Mmmmm…. One of the “best” orchards to visit is Sky Top Orchard, which provides incredible views across the North Carolina mountains, many activities and foods like fresh apples, of course, and apple cider doughnuts, too! The town of Hendersonville is home to many festivals throughout the year. The area is rich with outdoor adventures — those mountains beg to be explored by foot, bike, boat or raft. A popular vacation destination for adventurous families, be sure check for vacation packages — more value for the money! Photo credit Sam Dean, used with permission. Hands On! Children’s Museum is geared for the younger set (elementary and preschool age) with programs that encourage science and arts exploration. Admission is $5 for all ages — budget friendly! Team ECCO Ocean Center and Aquarium brings the ocean to the mountains. With 24 exhibits, visitors can learn about turtles, lizards, fish, sharks and other creatures. Part science, part entertainment, the whole family will learn about ocean creatures and how to care for this vital resource. Admission is only $4. 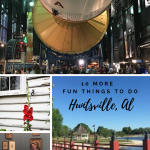 To learn more about the many other activities and attractions in the Hendersonville area, visit the tourism website or request a travel guide. Whenever you visit, I’m sure you’ll agree that the North Carolina Mountains make a great vacation destination! 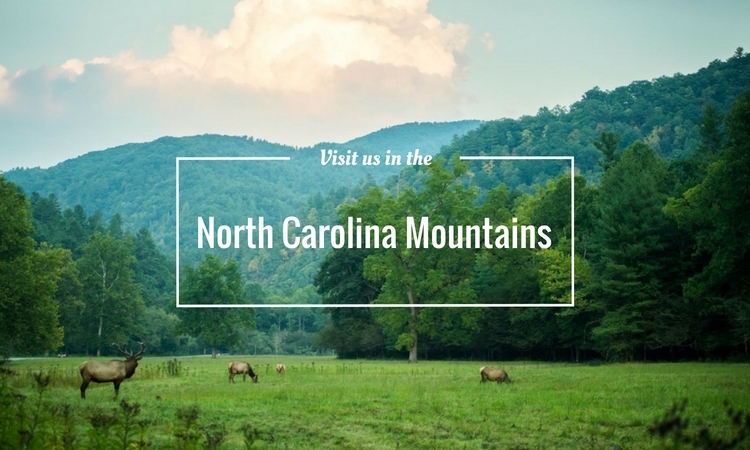 VisitNC has even more information about the North Carolina Mountains if you need it.